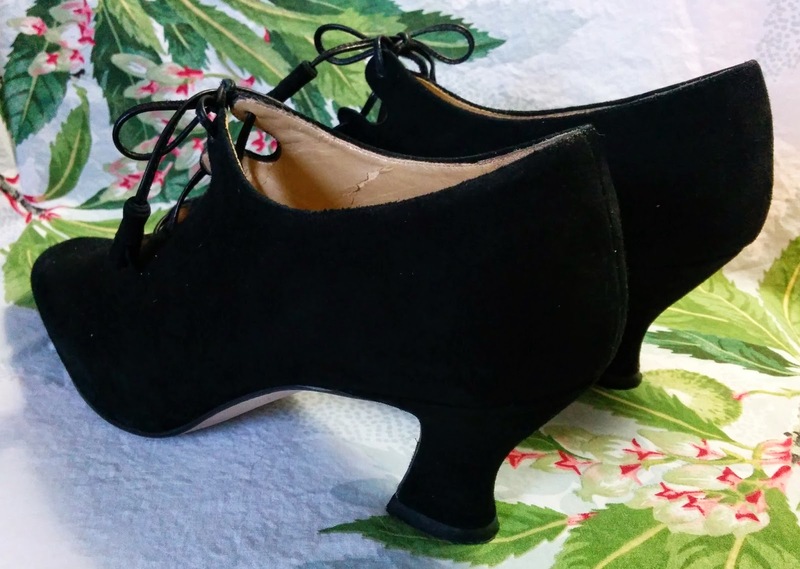 Thrift quest completed: vintage inspired black heels. I found an awesome pair of black suede heels at Goodwill for a few dollars. I love the 1930s vibe. The tasseled laces remind me of Ghillie Brogues from Scotland, the traditional lace up shoe you see on bagpipers. Ghillies originated as a basic flat piece of leather with holes punched around the edges and laces to hold the whole thing on your foot, sort of a Scottish moccasin. Sounds like a good idea for a future DIY post! I'm expecting Scottish style to become a surprise fashion influence this fall/winter since Outlander is premiering on Starz on August 9th. If you haven't heard of it check out the book by Diana Gabaldon and see what you think. I love the theme of science over superstition that threads through Claire's adventures in the past. Funny side note, for a long time I assumed everyone wore lots of dark colors and white in the 30s and 40s because old movies and photos are in black and white. When I started knitting again about 12 years ago, I searched for vintage patterns and lo and behold, it turns out that era was a riot of color! I plan to wear these with bright purple and green tights and fishnets in fall and winter. These heels are in pretty good shape, but I'm going to touch them up with a shoe brush and some black shoe polish. You can also use products like Kiwi Leather Shoe Dye that comes with a convenient sponge applicator built into the bottle if you have a lot of wear on your shoes. If the upper is in good shape but the sole is a bit worn, you can have them reheeled at a shoe repair shop. Lay down some newspaper to protect your work surface. Clean any soiling on the upper with a stiff brush (a suede brush or old toothbrush). If your shoes are plain leather or patent you can wipe with a damp soft cloth. For suede, use a soft shoe brush to apply shoe polish to the entire upper. For leather, polish according to manufacturer's directions to the desired level of gloss. As mentioned above, if your shoes are badly worn, you can use Kiwi Leather Dye or similar to recolor the leather. Shoe polish and dye can rub off on your feet or hosiery, so be sure to use a clean rag (an old T-shirt works best) to wipe the edges and inside where it will touch your feet. Relace shoes. If you don't like the laces or they're badly worn, replace them. Thick ribbons make jaunty bows (as always seal cut ribbon edges with heat or Fray Check to prevent fraying), or you could make mini versions of my Leather Tassels to emulate the shoes shown here. To make a mini version use thin leather cording from the craft store and instead of a marble inside, use a small wooden bead. Enjoy your new-to-you shoes and be sure to post pics sporting them around town! Share links in the comments below. 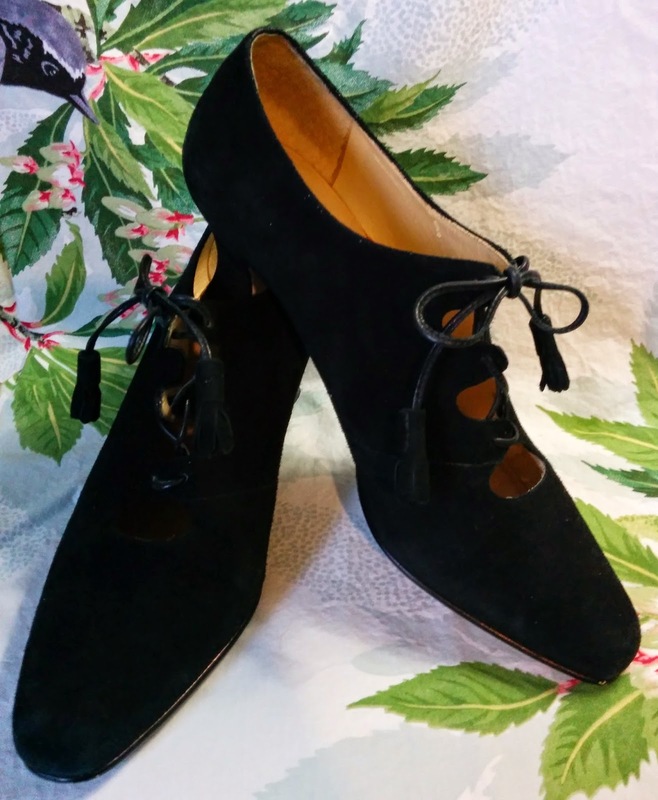 If you're having trouble finding vintage inspired shoes, you can give a newer pair vintage flair. Look for shoes with sculpted heels and add laces yourself. Just make holes with a leather punch/awl. You can also add a pair of vintage shoe clips for an instant and reversible effect. Watch for a future post about adding some sparkle to plain footwear.